Grease one 8” square cake pan. Cream butter well and gradually add the sugar. Once mixed, beat in the egg. Sift the flour, baking soda and salt together. Add to the creamed mixture, alternating with the buttermilk. Beat well after each addition. Add the raisins and lemon rind. Bake at 350 for about 30 min until the cake shrinks from the sides of the pan. 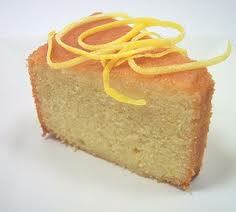 Mix the lemon juice and ¼ c sugar together and pour over the hot cake. Makes 9-2 ½ ” squares.